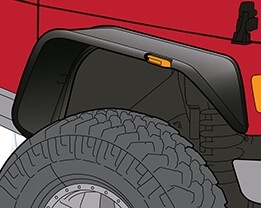 Spruce up your truck with a set of fender flares. We sell them in both black and color matched factory painted. Or do you just need to hide some rust around your fenders? We stock a wide selection of fender flares in multiple styles (OEM, Street, Pocket/Bolt, and Extended) so we have what you're looking for. If you're in the market for painted fender flares, we have a full catalog of pre-painted fender flares. Of course, we also offer the matte black finish in all styles, which looks great on any truck. Let your truck be the boss on the road, accommodate your larger tires, and give your truck the upgrade it deserves. Get fast & free shipping on all fender flares! Are these flares available painted? Some of them are! Here’s our full list of a color matched fender flares – available to match your factory color. If a painted option is available for your truck, you will be able to select your paint code next to the 'Add to Cart' button. If a painted option isn’t available for your truck, don’t worry! Most all fender flares can be painted by your local body shop. If you plan on having your fender flares painted by your favorite body shop, be sure to purchase a smooth or standard fender flare set. Textured fender flares cannot be painted. 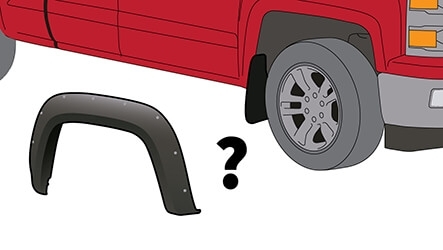 Will my mud flaps work with fender flares? Unfortunately in almost all instances, fender flares will be incompatible with your mud flaps. You’re going to have to choose – do you want mud flaps or fender flares? 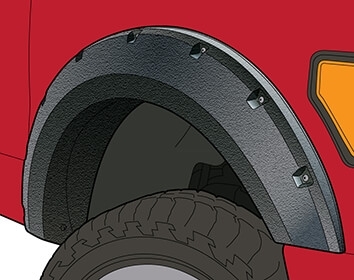 If you don’t mind drilling into your fender flares, in most cases a universal mud flap set can be installed with fender flares. Be advised that if you do this, you will void the manufacturer’s warranty for the fender flares. Are these flares street legal? Yes, the fender flares we sell are street legal. 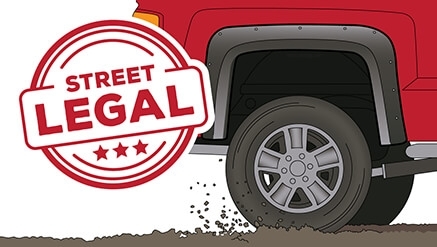 In fact, they may actually be required by law if you have oversized or large tires. Why would flares be required? When you drive over rocks, gravel or debris your tires can pick them up and spray them. 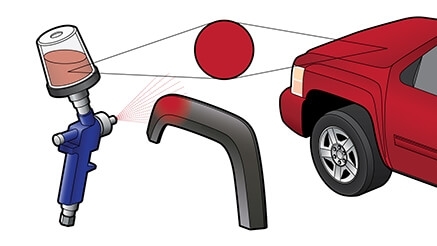 Normally your fenders will provide protection for vehicles behind you, protecting other vehicles from flying debris. When you add large tires, your tires may now be wider than your fenders. In these cases your fenders won't protect your truck or other vehicles from flying debris - this is why you need fender flares. The fender flares will make your truck wider (ideally, the same width as your tires), so that your flares will stop flying debris. Not only will you be helping other vehicles and making the highway safer, you'll also protect your own paint from unnecessary dings and scratches. Most fender flares are only offered in a smooth finish, which can be painted by any auto body paint shop near you. Smooth flares are the most popular style – most fender flares you see on the road are in the smooth style. 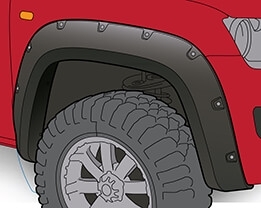 Textured fender flares are available for some vehicles and are a great option for people wanting a more rugged look. Textured fender flares cannot be painted, so you should not purchase textured fender flares if you intend on painting your fender flares. 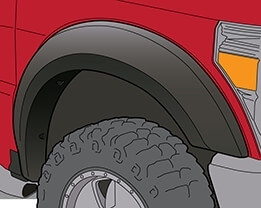 An alternative to textured fender flares is to have your local body shop paint your flares in a textured matte black – this is an increasingly popular look. Each of our fender flare sets will have a different set of measurements for Flare Height and Tire Coverage. 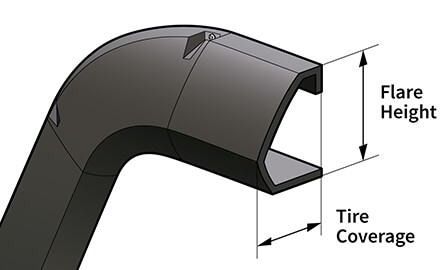 When you are viewing options, you can reference the “Specifications” section of the specific fender flare for measurements. The height of your fender flare is measured from the point at the top of the fender. This measurement is important if you are trying to hide some rust issues near the edge of your fender. Tire coverage measurements are important if you are trying to add coverage for your large or oversized tires. 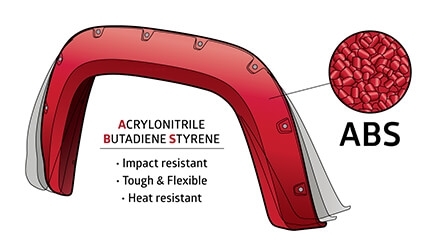 With a few exceptions, the fender flares we sell are made of ABS plastic or a form of ABS plastic. ABS is a high performance plastic extremely popular with automotive parts. Some may be surprised that the fender flares have a lot of 'bend' in them - this is actually by design. A rigid fender flare would be more prone to breaking or damaging your fender, if there were an impact to them. 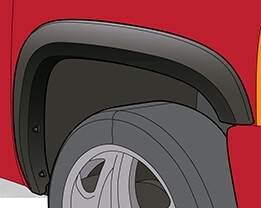 As an authorized retailer all of our fender flares come with the manufacturer’s warranty. 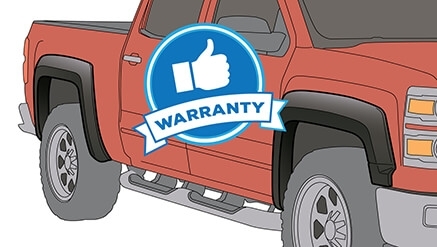 Warranty details can be found on each product page. If you have a warranty claim with a purchase from us we will be more than happy to assist you with it.